I’m not entirely sure what happened. It sounded like you created a presbytery and then joined it. Is that because Clearnote wasn’t already in one, or did you leave one behind? I learned of presbyteries while listening to the Practical Ecclesiology episode on leaving denominations. However, all I know at this point, is there is a lot I don’t know. I have the same question as Chris, essentially. Why create a new denomination? The Church has been divided on the sacraments since the Reformation. So could you give some insight about why there is compromise on paedo-baptism and not paedo-communion? There are advocates who can articulate their position cogently on both sides of the issue. Why the irenicism on one rather than the other? And, Tim, thanks for the recommend to Clearnote Indy West. 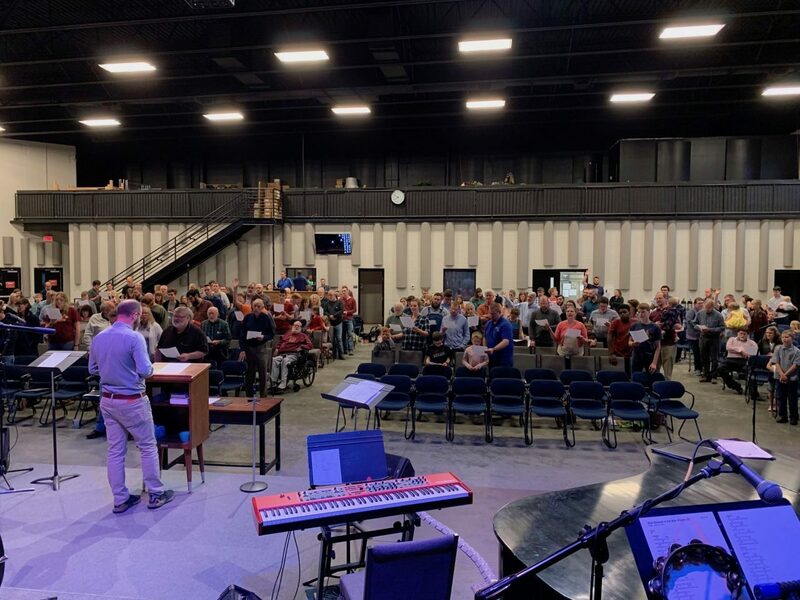 We spent several years putting together a book of polity, rules of discipline, and a directory for worship, then presented them to a group of men from several churches who began working on these documents to perfect them even more. After these men had spent another year or so on their work, it seemed the work was far enough along to hold a constitutional convention. There we perfected even more, but also began a list of places where we agreed we were not satisfied yet, appointing another committee to work on those places (about 40 of them). Yet we all signed on at that point, committing ourselves to take the documents as they were (40 problems and all) to our churches for their vote up and down whether to join the presbytery. At our congregational meeting last Sunday night, most of the same 40 things were brought up, so there’s close to unanimity about what needs more work, but our congregation voted to adopt the document as is knowing no document will ever be perfect and it’s our intent to keep working. Until a few years ago, I was in the PCA, having transferred there from the Presbyterian Church (USA) back in 1991 with my Wisconsin congregation called Grace Presbyterian Church. Clearnote Church, Bloomington has never been in a denomination. We have never believed it would honor God to remove our officers whose consciences are bound to one adult baptism. Seemed schismatic. In Presbyterian polity, the only difference between a denomination and presbytery is that a denomination claims to have a court of appeal above the local session and then the presbytery whereas a presbytery’s decision is final. Until there are a couple more presbyteries, at which time a general assembly is possible and I suppose some might want to call it a denomination. When one has actual experience with general assemblies and their judicial commissions, though, it’s immediately obvious that national level shenanigans are much the same whether political or ecclesiastical. Specifically, to refer to the PCA’s Standing Judicial Commission as the court of final appeal in the PCA is something approximating a joke, starting with the fact that it usurps the authority of the general assembly. We’re creating a new presbytery which happens all the time. For instance, here in Bloomington, the PCA’s first presbytery having jurisdiction was Great Lakes, then Ohio Valley, and now Central Indiana. Three different presbyteries just during my time living here. My conviction is that we should all forget about groups of presbyteries with national aspirations led by famous rich men with international aspirations. Instead, form a presbytery like ours among like-minded churches. Don’t despise the day of small things. As Bucky said, small is beautiful Subsidiarity. Appropriate ecclesiastical technology. Think how small Calvin’s company of pastors surrounding Geneva was. How small Knox’s was in Scotland. Concerning paedocommunion, we intend to be very accepting of people who want their children to be examined by the elders for becoming communing members at earlier ages than have been common the past couple of centuries. Calvin’s Geneva was willing to examine their covenant children as young as eight years old, but like Calvin’s battle with Geneva’s magistrates, we too will not allow anyone to the Lord’s Table who is not there specifically by the authority of the elders. We view the repudiation of elders’ authority over the sacraments by a significant number of paedocommunion parents (who think their children should come to the Table simply because they are their children) to be a much more serious violation of Biblical sacramentology than those who believe elders should have authority over baptism, but believe the children should not come to the the waters of baptism until they’re ready to confess their faith. Regarding baptism; Does the presbytery accept the London Baptist confession as well as the Westminster confession chapters on baptism? Thanks for the thoughtful reply. I’m sure your friend Doug Wilson would have an equally thoughtful rejoinder. We don’t have a slate of options like the CREC does, no; we go with the Westminster Standards. At the time of their ordination, credobaptist brothers would request and be granted an exception to the parts of the Westminster Standards that speak to infant baptism. You can see what’s part of the constitution here. Any plans for church planting? I have a really great recommendation if so.